This was the movie which shot Goundamani into ultra fame. Goundamani plays a drummer (mirudangam) in the music troupe of the hero in this movie. This is also the movie where the Goundamani Senthil duo started their slapstick type of comedy. Kovai Sarala was also a part of the comedy team in this movie. The “Valzhaipalam” joke is perhaps the most popular comedy scene in the history of Tamil Cinema and is evergreeen. The other comedy sequence which is popular in this is the car scene of “Swapna Sundari”. 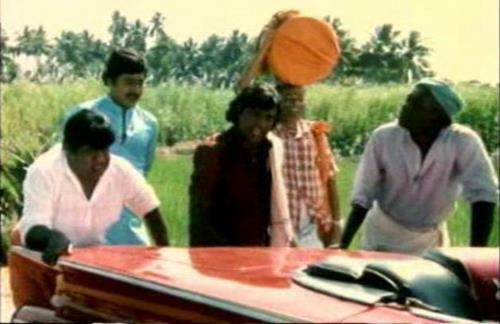 Goundamani, Senthil and Ramarajan in the famous Swapnasundari Car comedy from the movie Karagattakaran. This is probably Goundamani’s most famous character among all those h acted in. In the movie “Vaidegi Kaathirundhal”, Goundamani once again teams up with Senthil. He owns a cycle shop in this movie and constantly refers himself as “All in all Alagu Raja”. He rates himself as a brainy, scientific genious in this movie and constantly gives hilarious advices. This is movie in particular is known for his “nakkal” jokes. The hero of this movie is Vijayakanth. Goundamani’s usage of sarcasm is hilarious in this movie. Goundamani teamed up with Kamal Hassan in the movie “Sigara Velan” which became a super hit blockbuster. Goundamani’s comedy was hilarious in this movie. Vadivelu was also a part of his movie. Goundamani excelled in this movie with his typical hilarious comedy. Goundamani calls himself as “idea mani” in the movie “My Dear Maarthandan” in the movie starring prabhu. He helps the hero providing many different ideas. Goundamani appears as Kaalings in this comedy movie starring Karthik and Nagma. Karthik calls him as Kaalings. Goundamani wants to marry Nagma but it is Karthik who ends by marrying here. Goundamani also dances in the song “Velvetta Velvetta” in this movie in a funny way.